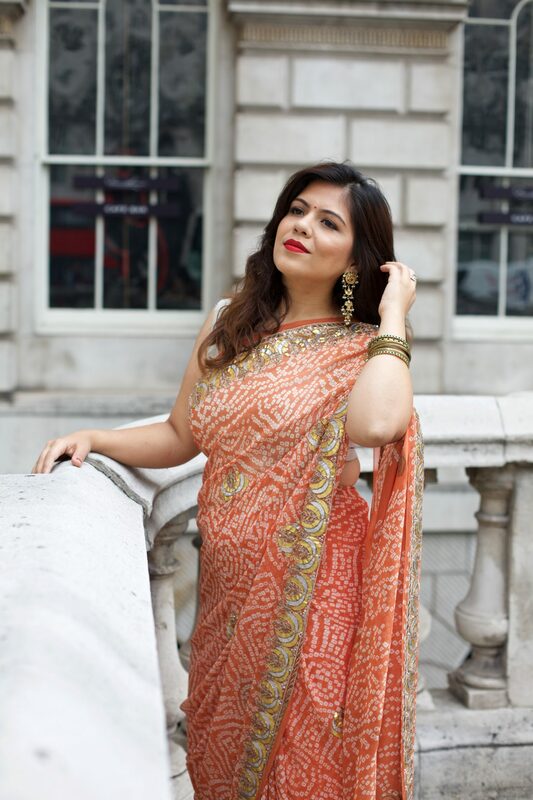 The Indian festive season would be around soon and as always for women like us who live away from motherland, it’s an opportunity to wear our colourful Indian wardrobe. We are lucky to maintain two wardrobes and the festive season sparks the dressing up excitement. 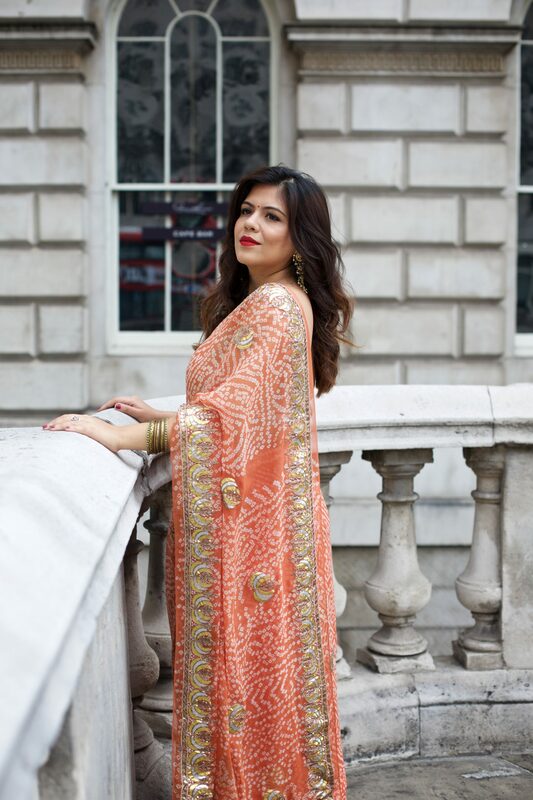 If you haven’t yet chosen your festive outfit and are looking for something new then let me help you by sharing two very traditional outfits from one of my favourite Indian designers based in London – Jyoti Chandhok. 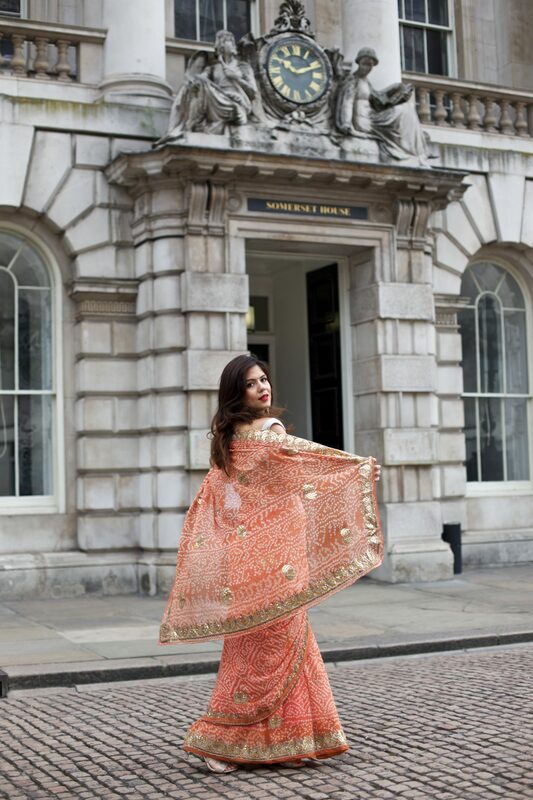 Jyoti is known for her traditional Indianwear using pure fabrics and hand embroideries. 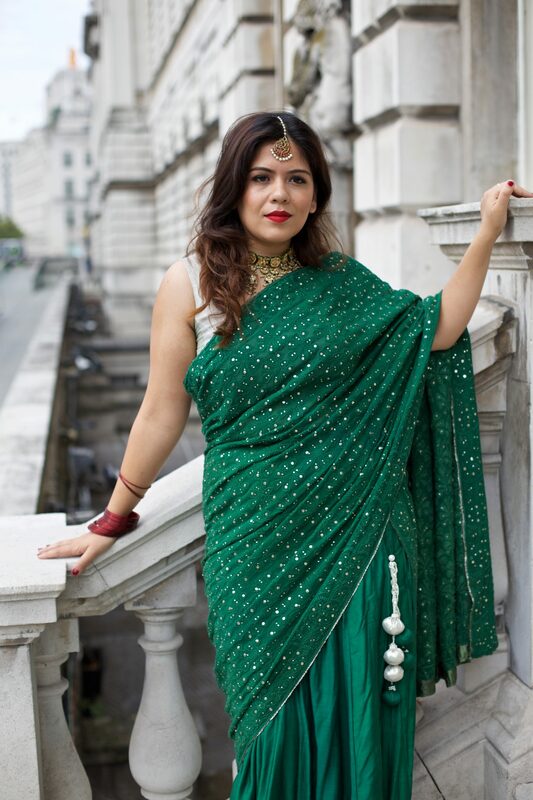 She can help you create beautiful one-off bespoke outfits. 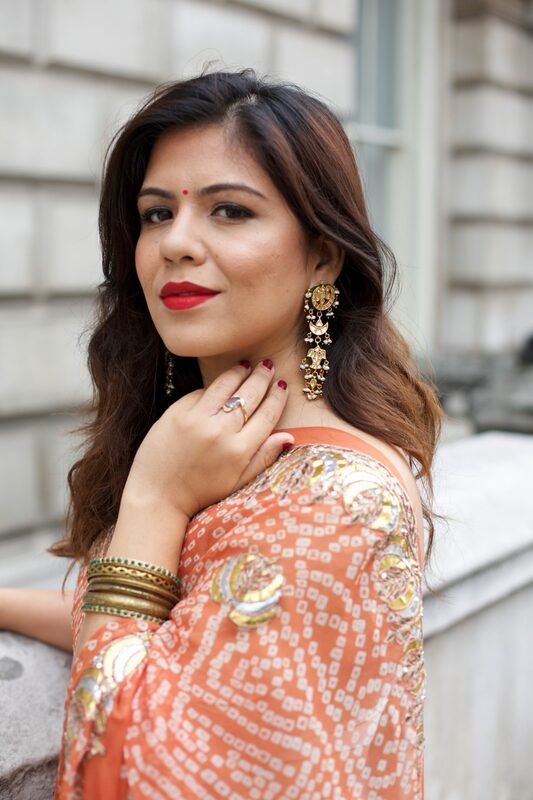 Her studio in North London is a storehouse of some beautiful hand embroidered pieces using techniques like chikankari, gotta patti, zardosi, kantha work and many more. The fabrics used are pure and authentic which will last you forever. I highly recommend a trip to her studio to explore some beautiful designs. 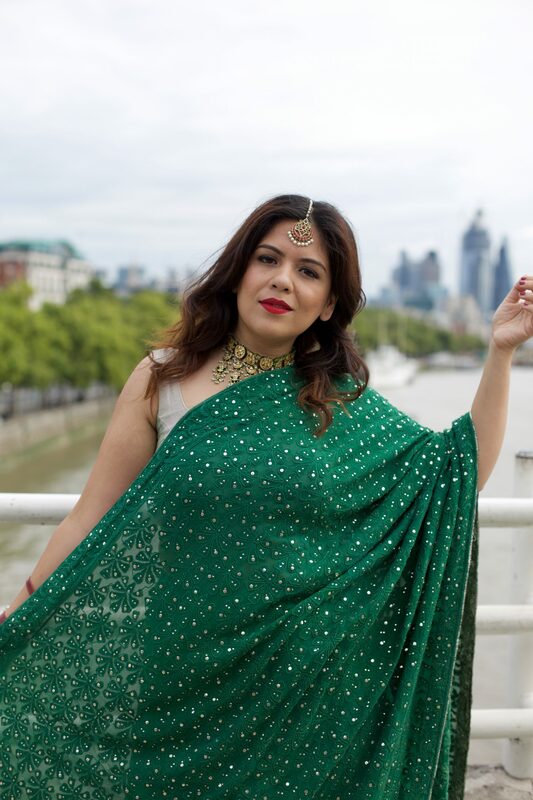 Today I am sharing two very rich and traditional Indian outfits from her new collection and this is how I have styled them. 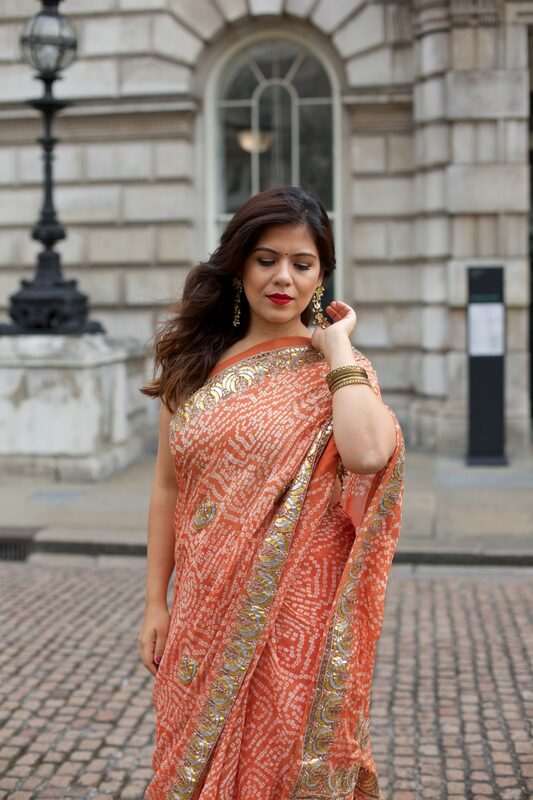 This beautiful bandhini sari is in a very pretty shade of orange. It is festive and traditional, away from the regular bright pinks and reds, in an unusual colour. 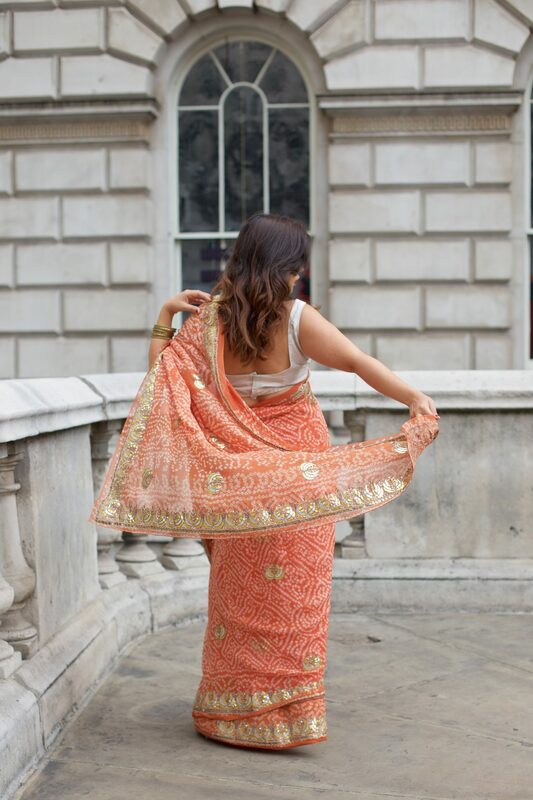 The sari has intricate gold gotta patti work on the borders. 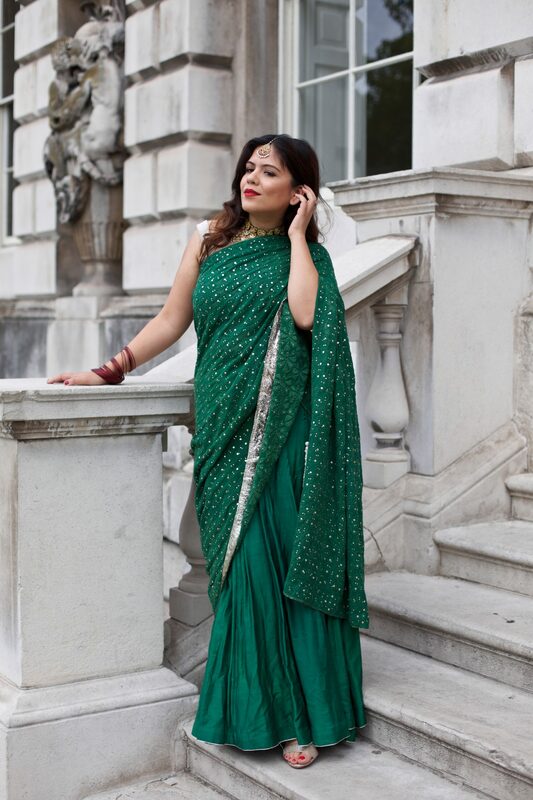 It is a very lightweight sari and easy to carry. 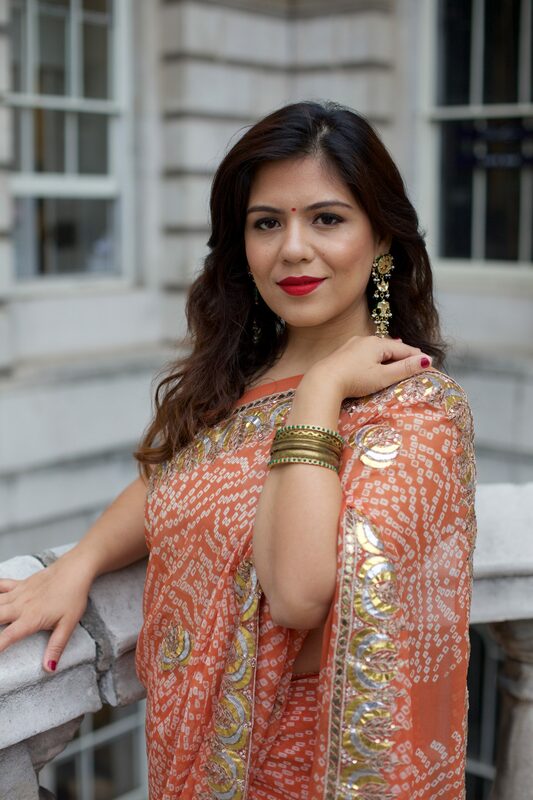 I styled the sari with some gorgeous earrings from Tanaya Coture .This is a bright festive look which ensures you will raise your style quotient. 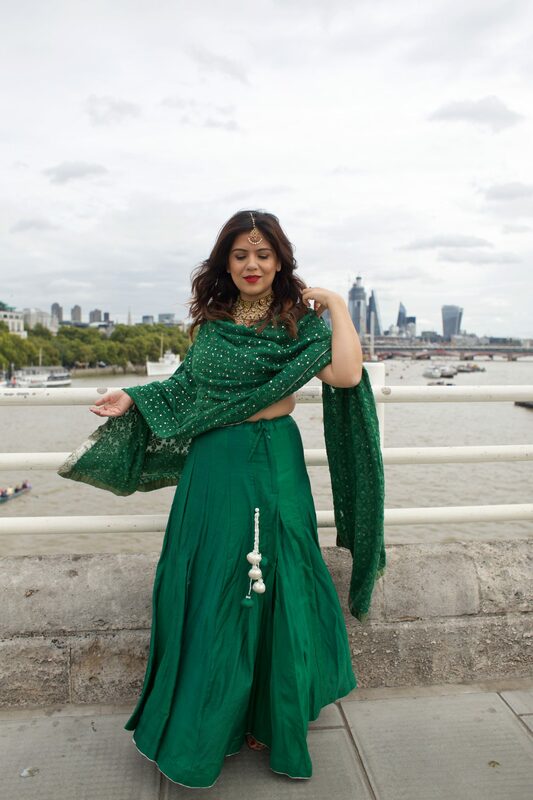 This unusual bottle green colour lehenga is made from silk cotton. 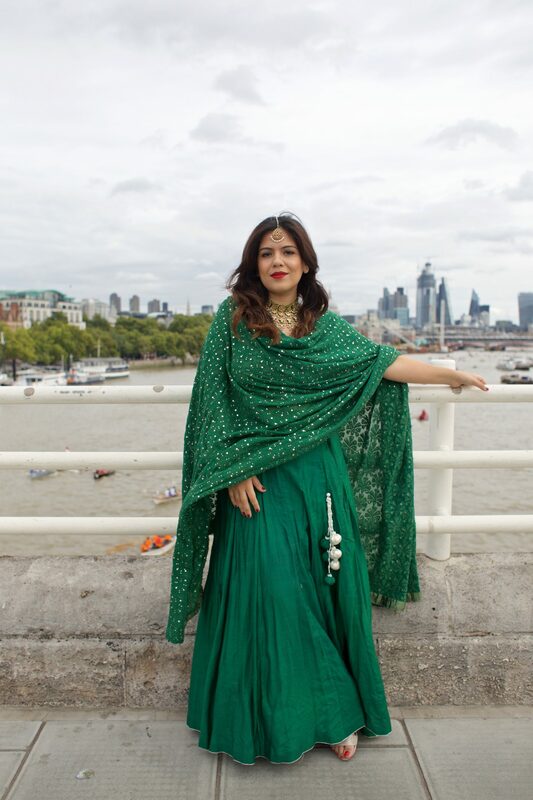 It comes with a chikankari and kamdani dupatta in georgette. 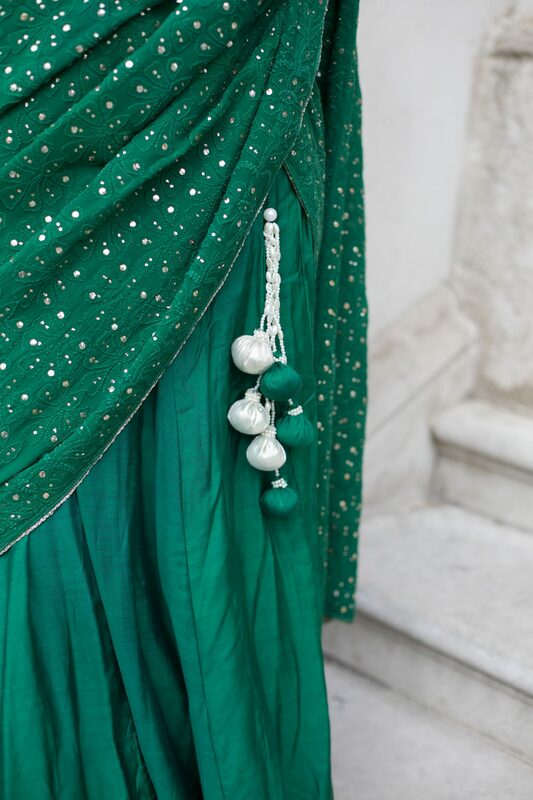 Normally chikankari is done on light pastel colours but this lehenga offers chikankari with kamdani on a dark rich bottle green colour. 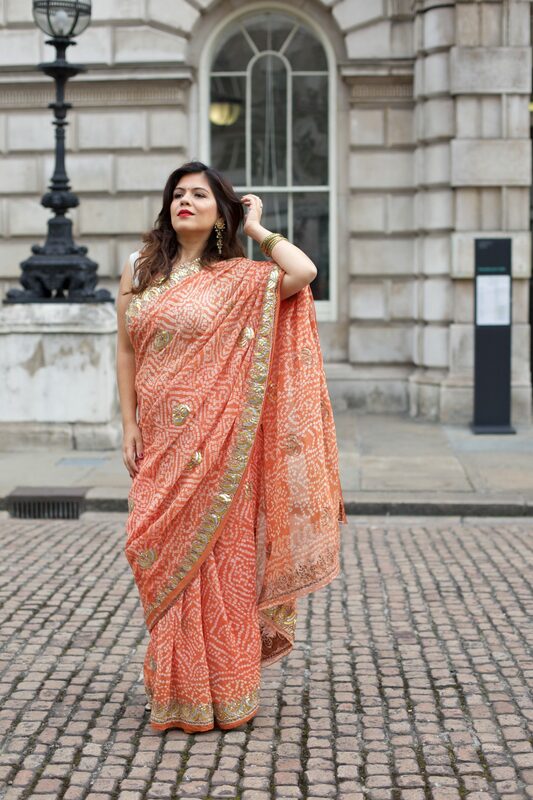 If you are bored of wearing your regular anarkalis then this lehenga is a good choice for your next Diwali party. I styled this lehenga with this intricate choker set from Tanaya Couture and my very favourite maang tikka from Amrapali Jewels. Both the above looks are very easy to carry and look regal as well. I hope you found some inspiration here for your next festive outfit. 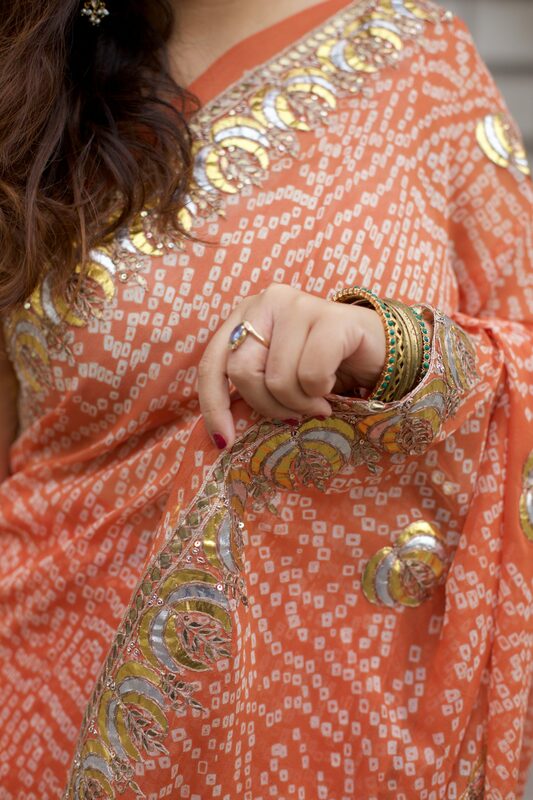 Do share your traditional looks with me. I would love to hear back from you guys. 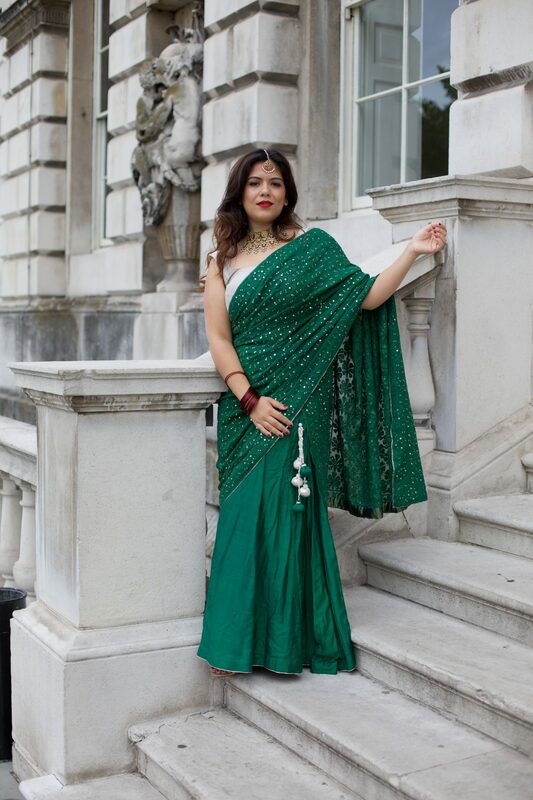 If you are looking for a festive outfit like the above then contact Jyoti Chandhok here. She can custom create an outfit for you based on your requirements. Finally, enjoy the festive season and I will be sharing more on how I prepare for it in London so stay tuned on Instagram.